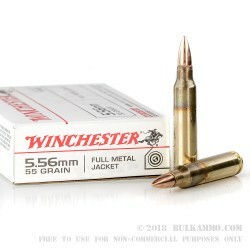 This case of 5.56x45mm ammunition is a great option for competition shooting with your AR-15. 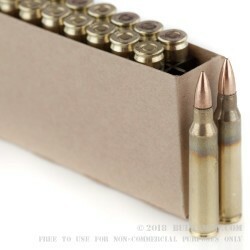 This ammunition has a 55 grain FMJ bullet, which very closely matches the old military round that US used when the M-16 first came out, the M193. And being that it is produced by Winchester to 5.56 specs, it should have no problems running through picky match grade rifles. 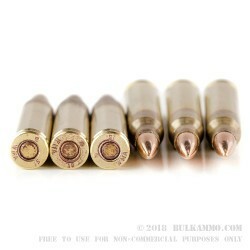 These rounds DO NOT contain a steel perpetrator, and are acceptable for use on steel targets. Each round is loaded using non-corrosive Boxer primers and reloadable brass casings. Quick, easy ordering. Fast delivery and great follow up on the whole process from start to finish. I will definitely be using them again, a soon! 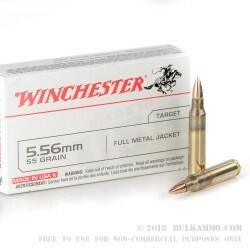 Q: Are these 55 grain bullets FMJBT (boat tail)? A: Hello! Winchester does not make any mention of the projectile in this round being designed with a boat tail style base. A: Hello Cory, This ammunition is new manufacture and loaded with all non-corrosive components.